Dannmar D-10ACX ALI-ETL Certified Two Post Car Lift 10,000 lb. Limited Time Offer Sale Price & Free 3 year Warranty Valid While Supplies Last! Please select a delivery option*: I have a forklift for unloading at my listed shipping address. Please drop off lift at local freight terminal. The D-10/ACX (formerly Brigadier 10ACX) is ALI / ETL Certified. This wider version of the D-10/AC (formerly Brigadier 10AC) is for wider vehicles and drive-thru clearance. Still an asymmetric two-post lift, the posts are rotated 30 degrees and spaced further apart giving you the ability to open car doors without the dents. This two-post lift will be an asset to any repair facility it is installed in. In addition, this lift can be angled in narrow repair bays to accommodate other lifts. One of Dannmar's highest selling two-post lift models, the D-10/ACX will out-perform others in its class at a highly affordable cost. Everything from the "Dura-Glide" polyethylene load bearings, to the heavy duty 3/8" equalizer cable have been carefully chosen for long lasting operation. These arm restraints lock automatically as soon as the lift is engaged. Seizing any horizontal arm movement once elevated. Just another step in lift safety. 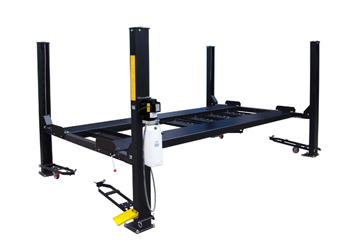 A heavy-duty steel, padded safety shutoff bar automatically stops the lifting mechanism if a vehicle touches the top of the lift. Saving you from thousands in potential damage to the car and lift. Every Dannmar 2-Post Lift comes standard with over-sized baseplates to completely hault any back and forth sway; and greatly reduce fatigue on concrete. The bigger the footprint, the more safe the lift becomes. The sheaves used to keep the aircraft-quality cables in line are made from heavy-duty steel, and with a 3" diameter, these are not your regular run-of-the-mill cable sheaves. We use ultra-high molecular weight polyethylene load bearings to protect the inside of the columns, increasing the longevity of the lifting mechanisms, and providing years of smooth, no snag, lifting. For conveniently releasing the safety locks from one side of the lift. The safety locks are in each column, spaced 3" apart. This many locking points ensures that you will find a comfortable working height, and it also is a huge step in becoming ALI approved for lift safety. Our unique dual-synchro equalization system haults any side from lifting faster than the other. This ensures that the safety locks will be engaged at the same time, and also makes sure that both arms are lifted evenly at all times - reducing stress on many lift components. We purposely manufacture the columns using single-piece construction for added strength and less fatigue under heavy load conditions. The clear-floor convenience of the Brigadier series lifts is just another feature directed towards the end-user. It allows for oil drains, tool boxes, transmission jacks, and many other useful pieces of equipment to be unobstructed under the lift. Making your job just that much easier. Optional frame cradle adapters are the perfect solution for raising certain vans or pickups. Rubber contact pads allow for protection for underbody vehicle components and undercoating. These unique baseplate adapter seats will stop any worry of losing your all-too-necessary lift pad adapters. Just another way to provide ease-of-use to our customers. Others might charge extra for these necessary adapters, but they're standard with every Dannmar 2-Post Lift. Ideal for trucks and vans with running boards or auxiliary fuel tanks. The hydraulic power unit uses a single-phase motor that requires 208-230 volts AC and a 25 amp breaker. A simple push-button switch raises the lift and a push-lever controls descent. Overall Width (Outside of Base plates) 143 ½"
Overall Width (Outside of Columns) 136 ½"
Width Between Columns 112 ¾"
Drive Thru Clearance 100 ½"
Please note that these specifications are subject to change without notice. It is best to confirm these specifications with a sales representative at the time of purchase. Includes detailed installation and maintenance instructions, graphic safety and maintenance decals and safety instruction placard guidelines. *Note The manufacture does not recommend the use of the standard pads to raise trucks & vans & any other frame-style vehicles. It is recommended to use frame cradle pads to raise these types of vehicles. Anyone who has ever lifted a full-bed truck onto a two-post knows what a dicey procedure it can be. Reduce your risk with these handy Frame Cradle Pads from Dannmar. Clamp-like design gives the vehicle nowhere to go except up and over when you decide. And the sticky-mat holds onto the frame and keeps it there, without scratching the hardware. If you've got a heavy vehicle to lift, especially a truck, then you're going to want a set of these Dannmar Frame Cradle Pads. Sturdy steel construction keeps the frame firmly between the lips, while the treaded rubber mats protect the finish and reduce the chance of slippage.